[ Printed lecture. ] Zetemata Dianoetika. Or A View of the Intellectual Powers of Man: with Observations on their Cultivation, adapted to the Present State of this Country. 'Read in the Literary and Philosophical Society of Liverpool, 20th November, 1818.' Second edition. Liverpool: Printed by G. F. Harris's Widow and Brothers; and sold by Longman, Hurst, Rees, Orme, Brown and Co. London. 1821. 64pp., 8vo. In fair condition, on lightly and worn paper, in worn contemporary half calf binding with front cover detached. The cover carries the gilt stamp of the Society of Writers to the Signet, and the front pastedown carries a shelfmark label. There is no other evidence of library provenance. Thomas is not named on the title-page, but he is the author of the dedication to Samuel Shore of Meersbrook, Derbyshire. Scarce: no copy in the British Library, and only four on COPAC. [Series of eleven printed British parliamentary reports, from the Library of Sir Boverton Redwood, and with his bookplate.] Report to the Secretary of State for the Home Department, on the Subject of the Testing of Petroleum. The eleven parts are uniform, headed from 'SERIES A. Series No. 1' to 'SERIES A. Paper No. 11'. Totalling 57 pp., folio, with the eleven parts separately paginated: 18 + 18 + 3 + 3 + 4 +  +  +  +  + 6 + . The first part is followed by three lithographed plates (the second a foldout) by Dangerfield of Covent Garden, from designs by 'F. A. Abel' and each dated and with his facsimile signature. 311pp., folio. With page of 'Errata' laid down on rear pastedown, under the manuscript heading 'COPY NO. 3. (PB).' With fold-out map of North America, and numerous plans and diagrams laid down in text, as well as several full-page plates. In original blue buckram binding, with 'REPORT ON AMERICAN VISIT | 1946.' in gilt on the spine. Good, on lightly-aged and spotted paper. [Mimeographed Typed Report, with plans and diagrams.] St. Anne's Board Mill Company Limited | Visit of Mr. R. J. Thomas and Mr. D. R. Hicklin to the U.S.A. and Canada - 1954'. [v] + 135pp., folio. With diagrams and plans in text, and one large fold-out diagram of '100 Ton Waste Paper Cleaning System'. A well-produced item, well-typed and with clear diagrams, bound in navy buckram with 'REPORT ON AMERICAN VISIT | 1954' on the spine. In good condition, on lightly-aged paper. The text is preceded by an Index, a map of North America, and an itinerary. The 'objects of the visit' are given on the first page as '(a) To obtain information on the current production practice in Woodpulp and Paperboard Mills. London: Printed for His Majesty's Stationery Office, by Darling & Son, Ltd, London. 1906. Folio, 22 pp, followed by 28 full-page plates of equipment designed to increase safety in the mills. Stitched. In original blue printed wraps. Text and plates clear and complete. Internally good, on aged paper. Wraps worn and chipped. Wraps with stamp and withdrawn stamp of University of Hull. No copy on COPAC or WorldCat. 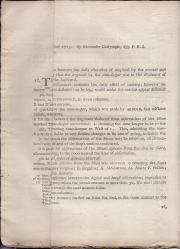 [Printed Royal Society paper.] Journal of a Voyage to The East Indies, in the Ship Grenville, Captain Burnet Abercrombie, in the Year 1775. 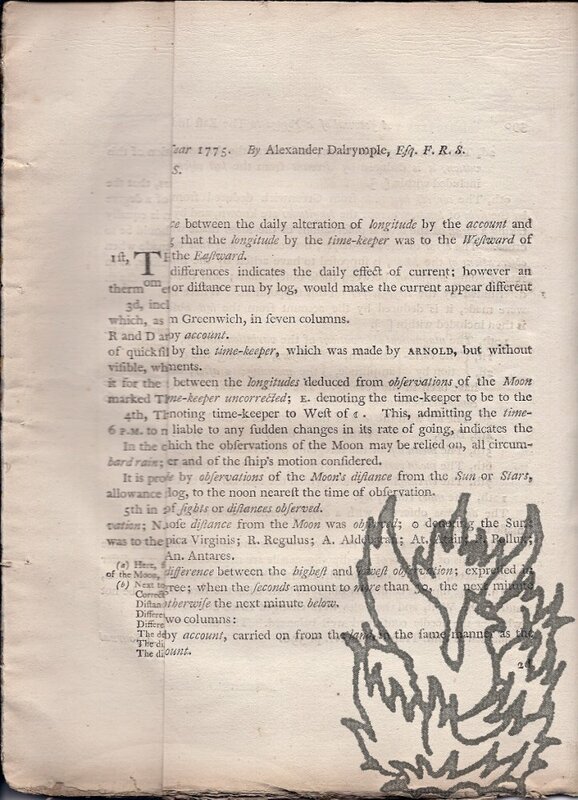 By Alexander Dalrymple, Esq. F.R.S. Communicated by the Honourable Henry Cavendish, F.R.S. Thirty pages, on both sides of fifteen leaves of landscape folio, with each leaf folded in to give the item a 4to shape. Paginated 389 to 418, and printed in double column. Disbound. Stitched as issued, with uncut edges. Text clear and complete. Fair, on aged paper. Excerpted from the Proceedings of the Royal Society, London, 1778. ESTC citation number N72283. The first two pages comprise an 'Explanation to the Columns' which form the rest of the paper, these being detailed meteorological tables.